[Above: Various Google Image search results for "Synaesthesia," 16 September 2012]. Most people don't know this about me (it doesn't come up often in normal conversation), but in my everyday life I experience something called synaesthesia, a type of perception often defined in cognitive science orbits along the lines of "a condition in which stimulation in one modality also gives rise to a perceptual experience in a second modality" (Sagiv & Ward 259). There are many types of documented cases of synaesthesia (for some, music evokes colors; for others, smell might evoke three-dimentional shapes -- Richard Cytowic describes the experiences of synaesthetes in an engaging way, and synaesthetes are even sensationalized as if extraordinary superheroes with mutant powers in this Discovery documentary). As for me, I happen to experience a comparatively mundane type of cross-modal perception of the sort that is the most well-documented in scientific literature so far: color-grapheme grapheme-color synaesthesia. 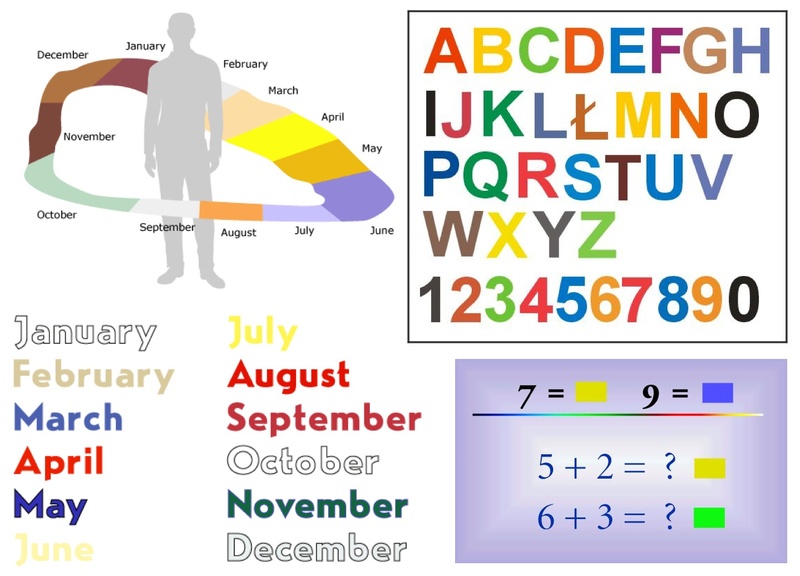 * This means that for me all letters and words each have their own distinct colors (as do all numerals, numbers, and units of time [days, months, years], but individual experiences vary from person to person). Speaking from my own experience, it's not so much that I "see" the letter E as bright lime green in "my mind's eye," but rather that "lime-green-ness" is inextricably tied to "E-ness" in my perception (in a similar way, five is inherently bright cherry red, no matter whether or not it's transcribed as five, 5, or in any other language I happen to know: 五, fünf, cinq, etc.). Whenever my synaesthesia happens to come up in conversation, I get a range of reactions: some people look at me like I'm crazy and others have a more bemused reaction, as if to suggest I'm just being highly imaginative. But for me synaesthesia is an involuntary and entirely real experience. Whenever I see 5 on a page or screen -- or even when I just think of the number five -- it is always bright cherry red. (If you don't experience synaesthesia, there are some ways to approximate it: synaesthete Cassidy Curtis offers a nice Q&A and "color coding" of letters and words; and this interactive Flash applet lets you type words and approximate what synaesthetes experience while typing or reading). But as much as I can tell another person that Mondays are bright yellow or that the year 1381 is purply-green, such explanations will never quite "click" for a non-synaesthete. Human language alone can never properly encode the fullness of embodied sensory experience. 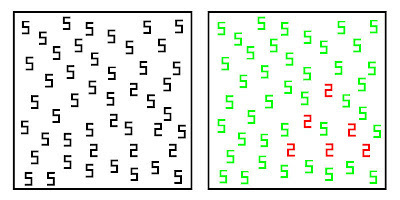 Indeed when I talk with other people who happen to have this kind of synaesthesia we'll discover that our individual perceptions don't even match up: it can strike me as entirely "wrong" and "unnatural" when another synaesthete says that her 5 is blue, or that her letter R has a distinct texture (or even gender!). What I find so interesting about the discourse of Ramachnadran and others is this insistence that synaesthesia is not "just a metaphor." We all use phrases like "loud shirt," "bitter cold," or "sharp cheese" and automatically understand such phrases are instances of cross-modal metaphor, a mere trick of language. That is, we all know a loud shirt is not actually making any sound, for instance, and we are metaphorically employing one sense (sound) in order to discuss another (sight). But what if one's sense experience is effectively already cross-modal? What happens to metaphor then? Ramachandran & Hubbard have their speculations: if "[s]ynaesthesia is a concrete sensory phenomenon [with] neural basis" (R&H, "Window" 4), then the (possibly) "more cross-wired" brains of synaesthetes might suggest "the neural basis of metaphor" itself (R&H, "Window" 28). Metaphor, R&H might suggest, is at its core a type of cross-modal thinking; one must always think in one modality while activating another. I am NOT claiming to be an expert on neuroscience in any way here (and indeed I'm cherry-picking from Ramachandran at the moment, so if I'm somehow misconstruing or misrepresenting anything above I stand ready to be corrected!). What intrigues me here as a literary scholar is the discursive deployment (or disavowal) of metaphor itself as a means to understand those who are perceived to have nonstandard modes of sensory perception. This semester I'm teaching a course on medieval disability, and I'm particularly interested in how often metaphor gets deployed as a means to inhabit any mode of sensory experience that is alien to one's own. In literary texts, blindness is often explicitly employed as a metaphor -- and texts representing blind or visually impaired people are not necessarily concerned with understanding any "authentic" lived experience of blindness but instead mobilize the various cultural meanings of disability for their own ends. St. Cecilia in Chaucer's "Second Nun's Tale" deploys blindness and sight for rich metaphorical resonance. She has privileged insight (she can see an angel the non-Christians cannot), and she employs a metaphorical discourse of blindness in order to express her pagan adversary's lack of faith (calls him out on his spiritual "blindness"). In this case, the unconverted pagan can physically see i.e. process external stimuli -- "There lakketh no thyng to thyne outter yen" (498) -- but in in a spiritual (metaphorical) sense he cannot "see" (recognize, believe) that the pagan idol in front of him is actually a mere stone object. There's a lot to be said about sight/blindness here, but what I find most interesting is the attempt to make an intersubjective bridge between two worldviews via cross-modal metaphor. 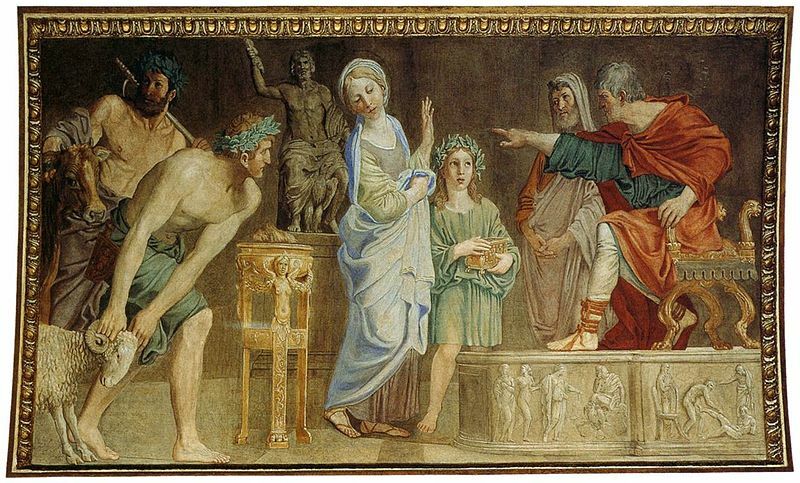 We start off with incompatible perspectives: the pagan man recognizes the "ymage" as a god, while the Christian woman knows it is stone. In an attempt to bridge two fundamentally different modes of perception, St. Cecilia deploys a complex cross-modal metaphor: "I rede thee, lat thyn hand upon it falle,/And taste it wel, and stoon thou shalt it fynde,/Syn that thou seest nat with thyne even blynde" (502-504) [emphasis added]. If the pagan were only to bracket the (distracting) sense of sight, he might touch -- and thereby "taste" (in Middle English, this is a pun meaning to taste and/or to perceive) -- that the stone is stone. What makes this passage so difficult to unpack is precisely its use of mixed metaphor, a rhetorical strategy that conveys the effect of cross-modal perception. In this case, one can never bridge the gap between the pagan's mode of perception and the Christian one (this pagan does NOT convert), so the privileged (Christian) discourse can only end up employing a seemingly haphazard mix of sensory modes to denote other ones. In this discussion of the subjective experience of synaesthetes as well as "blind" people (scare quotes are deliberate in this case! ), we find that metaphor can only take us so far in describing any sensory orientation toward the world that is alien to our own (as much as we may try to inhabit different modes of embodiment and lived experience). Nonstandard or extraordinary sense experience not only reconfigures our very choice of metaphors but also invites us to more carefully consider the material and corporeal underpinnings of metaphor itself. Sajiv, Noam & Ward, Jamie (2006), "Crossmodal interactions: lessons from synaesthesia." Progress in Brain Research 55: pp. 259-271 [PDF]. Cytowic, Richard E. The Man Who Tasted Shapes (Cambridge: MIT Press, 2003). See also Cytowic, Richard E. Synaesthesia: A Union of the Senses. 2nd Edn (Cambridge MIT Press, 2002). Ramachandran, V.S. & Hubbard, E.M (2001), "Synaesthesia: A window into perception, thought and language." Journal of Consciousness Studies 8, 12: pp. 3-34 [PDF]; Ramachandran, V.S. & Hubbard, E.M (2001), "Psychophysical investigations into the neural basis of synaesthesia." Proceedings of the Royal Society 268, pp. 979-983 [PDF]. Some of these same cross-modal metaphors are listed as examples by Ramachandran, V.S. & Hubbard, E.M. (2003), "The Phenomenology of Synaesthesia." Journal of Consciousness Studies 10, 8: pp. 49-57, at p. 52 [PDF]. * P.S. 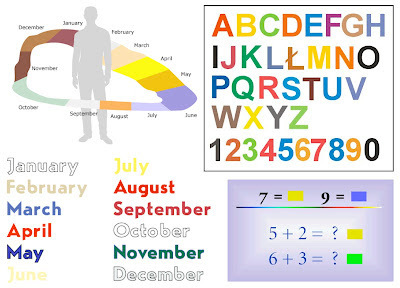 Just noticed an error above: it's "grapheme-color" synaesthesia, not "color-grapheme" synaesthesia. I've kept the strikethrough here so you can see the error -- my transposition of words (a typing equivalent of a Freudian slip?) suggests how intertwined my experience of letters and colors really is. Great post Jon. I'm reminded of Ian Bogost's notion of 'metaphorism' in Alien Phenomenology, which, iirc, is basically a description of the way that all contact between things is, basically, metaphorical. It's not just the 'carrying over' of metaphor, but the fact that the contact between, say, fire and cotton (a favored metaphor in object-oriented philosophy) is not only always partial (the fire doesn't perceive the cotton's whiteness, for example), but also always partial, a carrying over of the cotton's character into that of the fire's understanding. Metaphor is contact, in other words, and the inescapable character of contact. ...although now that I write this, I'm a bit befuddled, since a synaesthete's contact with the concept 'April' is just plain different from mine. Mine doesn't feel like a translation at all (except insofar as April trails with it various associations: family birthdays, bunnies, cruel months, etc. ); but neither is a synaesthete's April, to them. So I'm at an impasse for now! Thanks, Karl. I was wondering if someone would mention Bogost's re: metaphor and the idea that *all things* only ever interact via metaphor; we can never get to the true substance/materiality of things b/c we are always (by necessity) metaphorizing materaility itself. What I like about SNT and other moments re: stone idols or Mandeville re: simulacra etc. is this idea that materiality puts faith itself in crisis. Seems to me that the raising of the Host in the Eucharistic ritual is a speech-act-and-citation (hoc est corpus meum) that makes metaphor and materiality one and the same. Fascinating, Jon. This comment will perforce, ramble. I hope you will take that rambling as a sign that it seems fun to engage on this a little. I am teaching a first-year seminar (Brain and Literature) with a neuroscientist this fall and we just spent a session on multisensory and cross-modal imagery on Thursday; I am most certainly not a neuroscientist, and I rely on my co-teacher to keep my facts straight, a luxury I do not have out here in the naked blogosphere. I had a student in an upper-division course last fall who experienced a form of synesthesia known as "ordinal linguistic personification" (sensing biological gender in letters and numbers). This student had never heard the condition described: she just thought she had a strange brain. My presentation on it last fall sent her on a semester-long journey of research and reflection and some fascinating poems (she's in the MFA program here), and I learned a lot more, much more than I could have otherwise hoped. It seems as though many (though clearly not all) synesthetes have multiple, overlapping forms of cross-modal experience rather than just one (i.e., ordinal, grapheme-color, personification). I suspect that the more research and broader cultural discussion of it there is, the more we'll realize that subtle and less pronounced versions of neurological synesthesia are much more common. (Ramachandran himself writes about the students who approach him after his lectures). One emerging theory is that all infants begin life as synesthetes, and that synaptic pruning, followed by myelination, tends to create narrower sensory channels that synesthetes, for reasons not entirely clear, never close down. The evolutionary value of cross-modal matching is evident, and as long as synesthetes are not harmed by, and perhaps even enhanced through, their ability, there would be no particular reason for that trait to diminish their fitness. 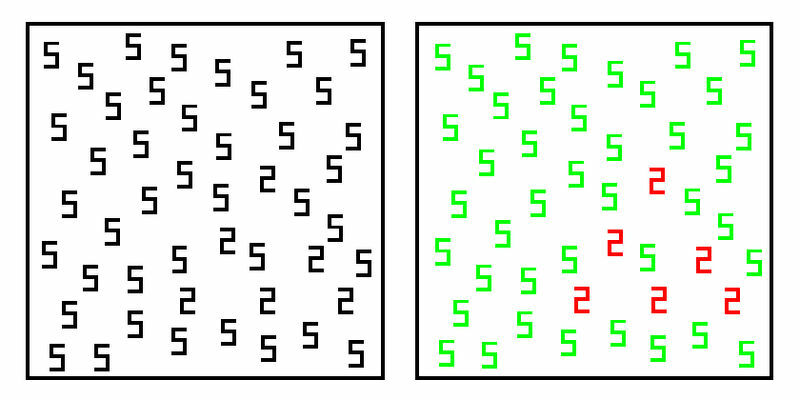 In any event, one detail in your post caught my attention, b/c it seems to indicate that you are a "higher-order" or "upstream" synesthete: if you respond to the color in the number 5 regardless of language, then the cross-modal matching is happening at a level beyond primary visual processing, and therefore in or around the fusiform gyrus, yes? That area, and the broader area of the so-called TPO junction (where the temporal, parietal, an occiptal lobes converge) seems to be a very important place where we do a lot of our neural "work" in comparing sensory information. It's not a language center, necessarily, but of course all of the sensory areas articulate robustly to our language areas. Anyway, if all things are metaphorical, it's because experience is always already cross-modal and cross-sensory, not because of anything special about metaphor, right? Metaphor would be, cognitively, a layer or two of abstraction higher than our primary processing of the sensory world where our senses remain locked to one another for obvious reasons of efficiency, clarity, and animal need. We need our eyes to hear and ears to feel if we have any chance of narrowing the ultimately unbridgeable gap between our brains and the world, a gap that we have to leap over millions of times a day. Unknown: Excellent. Thanks so much for your responses here - I actually really like the rambling - - and I *love* that you're taking part in co-taught Brain and LIt course! Yes, I've heard of the "ordinal linguistic personification" thing before - in fact encountered a few syn. who have told me about this, even discerning distinct *personalities* with those ordinal embodiments. This would take us one step toward allegory, right? I'm sure it really is much more complex that we think of and it's not just a cross-modal interaction along 2 modes, but a cluster of concurrent, mutually-informing modalities. I think one area for development is research involving bilingual/multilingual subjects. Yes, my 5 works across languages (also V is five if I know it's "supposed" to be a numeral and NOT the letter - yes, it changes color from green V to red 5) so I'd guess that connection is happening on a prelinguistic level. PS. By the way, my point of "discovery" or "coming out" as a synaesthete was in via Ramachandran. I was sitting in a neuroethics course and R was invited to give a talk; he presented a version of that 5 & 2 number matrix and I immediately discerned the triangle of 2's. Don't remember exactly the convo that unfolded, but I def. remember talking with R after the class and being flabbergasted that my perception was *unusual* much less that it was a "thing" with an actual name. And, so, the multilingual synesthetes would allow one to differentiate all kinds of things, both where in the sensory stream the cross-modal matching is taking place (and again, in neural synesthesia, that's probably and mostly pre-linguistic) and whether it is "high" or "low" based on whether a particular linkage "matches" across language or does not (if it does not, the matching is happening in the primary visual cortex before the associational / integration areas). But language itself would not be (and I cannot resist) coloring the experience. I like that connection to allegory, and I think it is very useful to think through the ways some of our "primary processes" result in some fairly complex cognitive work, way before we've become even aware of them, much less systematized them at the level of language and culture. I appreciate your reminding people that by employing metaphor/poetics they have not gotten beyond speaking for an-other's experience/p.o.v. to speaking from it, and that there should be some ethical humility (and some foregrounding/owning of the as-if quality of such works) in any venture to sketch out alien phenomenology. We should view such experiments as works in a prototypical, not arche-typal, mode. Ashby - that's really great. I don't know much about the current state of research but it would be very intriguing to see how the relationship between multilingualism and synaesthesia could be mobilized to test any number of factors. Thinking out loud, I wonder if grapheme-color synaesthesia that does NOT match up across a multilingual person's various languages might provide some sort of "index" of one's relative degree of second (or third-) language acquisition. dmf: I appreciate your comment in turn; "ethical humility" is exactly what I am trying to suggest in this posting - if we are being completely earnest, we must acknowledge and as you say "own" the as-if quality involved whenever we reach toward understanding another POV. Karl - I was thinking a bit more about your comment re: 'translating' April, and for me it's more of both/and. April *does* carry associations of bunnies, tulips, "shoures soote" and the like and ALSO it's inherently dark pink-light red. This is a weird case though where language and perception can interfere. In Chinese April is simply "fourth month" (四月) so when I see/hear/think of April in Chinese it's brown (4 is brown). If i'm "thinking about April" in English (or Indo-European language), it's pink-red again. Similar thing with days of the week - since they have numbers in Chinese but "names" in English/IE languages. In any case "units of time with names" def. operate under a different color scheme than numerical sequences. So weird.